We often use words without knowing their origin. 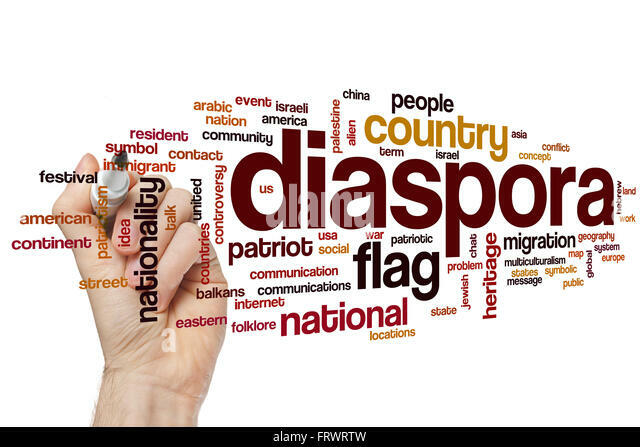 The word Diaspora comes from the Greek word, “diaspeirein” which means to scatter or spread out. Jamaica currently has a population of 2.8 million people and there are some estimates which indicate that another 3 million Jamaicans live in the Diaspora. Jamaicans have always being a migratory set of people. Recently, I reached out to three colleagues living in the Diaspora to hear from them their views on migration, and whether or not they would re-settle in Jamaica. My colleague Errol Douglas hails from the community of Thompson Town in the parish of Clarendon. Errol who is married describes himself as mature, outgoing, adventurous, educated and a family man who loves Jamaica. He sees himself as a global citizen and an economic refugee living in the United States of America. His primary education was at Thompson Town Primary and St. Thomas Moore Preparatory schools. He passed his Common Entrance Examination and attended Clarendon College. Errol migrated at age 22, having completed tertiary level studies at the MICO Teachers’ College as well as one year of studies at the University of the West Indies, Mona Campus. Errol reminisces about his early years fondly. He said his childhood freedom of immersing in the Jamaican country life and enjoying nature was remarkable. His fondest memory, “…was spending time with his grand-parents, visiting the farm, riding a donkey across the river and observing the pristine beauty of the Jamaican agrarian life.” Additionally, he recalls the many riverside picnics, soirees and cook outs with his friends while immersing in the natural beauty and exquisite cuisine of the Jamaican countryside. He added that life in Jamaica was “beautiful, blessed”. He recalls that, “I enjoyed all the comforts and cultural exposure with the love and security of a middle class family of supportive parents, siblings and extended family.” Unlike most Jamaicans who experience some form of culture shock when they migrate, however, Errol did not fall into that category. “I used to visit the USA often as a child and teenager. My visits were given to me as a reward for doing well in school.” Errol is currently a teacher in New Jersey. He holds Master degrees in Education Administration and Supervision and another in Special Education. As it relates to returning to Jamaica, Errol says he would without a doubt. He hopes to do so within 10 years. He has invested in the land of birth in the tourism sector and visits Jamaica 2 to 3 times per year. Is he concerned about the high levels of crime and violence in Jamaica? “Extremely concerned I think of it every day and bemoan my paradise as being lost. I am still positively, prayerfully, hopeful though.” When asked the question, to what extent do you think the government is working to persuade Jamaicans overseas to return home, Errol equivocally says, “zero extent.” Errol is 56 years old. Delroy Dunkley shared his experiences as a Jamaican living in the Diaspora. Delroy holds a PhD in Education Reform: Curriculum Assessment Pedagogy from the Institute of Education in London, England. He grew up in Black River in the parish of St. Elizabeth. He is clearly not embarrassed to speak about his humble beginnings. He was raised by a single mother in a 1 bedroom house along with four other siblings. He describes himself as friendly and sociable. I can attest to this personality trait of his as I met Delroy while we were first year students at MICO in 1990. He is very adamant about maintaining his friendships and makes the effort to remain in contact with friends and family despite having studied, and currently living, in the United Kingdom. Delroy says he grew up poor but after teacher training at MICO Teachers College his life changed for the better. He attended Black River Primary and High Schools, and the University of the West Indies while in Jamaica. ” Delroy’s entire life clearly is a testimony of his personal philosophy which is “I believe passionately in education to change one’s life.” He plans to return to Jamaica in 9 years to develop his real estate holdings which he plans to expand into a recreational facility. What does he miss about living in Jamaica, Delroy says, the vibes, the people, the food, the drink, you name it. Like most other Jamaicans he is very concerned about the high levels of crime. He says the government is doing their best to reduce the high crime rate. “I think the government and people must come together to support the reduction of crime especially murders.” Delroy will be 46 years old in August. Despite the high cost to travel back and forth from England, Delroy tries to return home at least twice yearly. He is a big fan of soca music and usually one of his visits home is scheduled around carnival. Delroy has a philanthropic side to him. A few years ago Delroy and his cousins Sandra and Tamesia established a Go Fund Page which has raised donations to assist the Black River Primary School. Delroy and his cousins have spearheaded the painting of the Black River Primary School as well as putting on a Christmas Treat. He is currently seeking funds to purchase a printer and a computer for the school. Kurt Hickling shared part of his experience living in the Diaspora. Kurt migrated at 30. He describes himself as a quiet, courteous level-headed guy with a passion for justice. “I like debating political and social issues with other enthused people. I believe in being professional about my work and I believe in trying to bring quality to my work.” Kurt was born in St. Andrew at University Hospital of the West Indies (UHWI) in 1976. He attended Bridgeport Infant, then Independence City All Age, Calabar High and Bethlehem Moravian College. Kurt is the eldest of three boys for his mother and comes from a poor background. He added that his mother although married provided mostly for her children as her husband was abusive and a drunk. “My mom instilled the importance of reading and being educated. “ When asked whether he experienced a culture shock when he migrated to the United States of America, he replied,”The culture wasn’t shocking at all. Being previously close to US culture through cable TV, I was able to fit in almost immediately.” In response to the question what is your fondest memory of living in Jamaica he responded, “being able to travel on public transportation and having encounters with locals who were hilariously funny and friendly”. Are there any comparisons with living in Jamaica and where you currently? His response was, “I feel much safer where I live now than my dwelling in Jamaica. I remembered hearing gunshots almost 3 times a week in Jamaica but I have heard a couple gunshots here in the US”. Kurt still has some family in Jamaica. “I do have a few cousins left on the island and they keep in touch social media in terms of WhatsApp and Facebook.” How often do you visit Jamaica? “Not very often.” I returned twice in the 11 years since I left. Do you plan to resettle in Jamaica? If yes, how far advanced are those plans? “I will never retire in Jamaica because of the criminality and the wanton disregard for the rule of law.” To what extent are you concerned about Jamaica’s high crime rate? Kurt was clear about Jamaica’s crime image. I am very concerned about Jamaica’s crime rate. “I’ve never felt safe living there or when I visit.” Would you encourage other Jamaicans living overseas to return home? “No, I would not.” To what extent do you think the government is working to persuade Jamaicans overseas to consider returning home? “I’ve heard radio discussions on the topic and I’ve heard of a few incentives being offered to returning residents. Other than that I haven’t seen much else.” Kurt taught for 2 years at the primary level before migrating for better economic prospects. The stories of Errol, Kurt and Delroy while different represent to a great extent the stories of the thousands of Jamaicans who have left our shores. The number one push factor for migrating continues to be one grounded in economics. Humans have an unquenchable desire to improve their social status and that of their family. The country’s inability to tap into the wealth, skills set and talents of the almost 3 million Jamaicans who live in the Diaspora should be an area of concern. According to a presenter at the Jamaica 55 Diaspora Conference held at the Jamaica Conference Center in July of 2017, the value of the Diaspora to the Jamaican economy is approximately 16% of the Gross Domestic Product (GDP). In 2014 remittances to Jamaica amounted to US$ 1.92 billion. In order to move the country forward we obviously need to listen from the voices outside and work harder in harnessing the economic and intellectual abilities of those Jamaicans living in the Disapora.